A hermit locks himself in a tower for a 40-day meditation on the fate of the Earth. And then he logs in to Twitter. "First tweet from the tower: About to tackle the first job of any new tenant. Find a mop and bucket. The whole place needs a good scrub." Crazy? Maybe. But Ansuman Biswas isn't one of your typical old-school hermits. And the tower in question isn't on a remote Himalayan mountainside, it's on Oxford Road. The Manchester Hermit is a living exhibition at the Manchester Museum. And he's both completely isolated and communicating freely with the outside world via two Twitter accounts and a blog, not to mention a very savvy marketing team. "... My own hermetic training is in the Theravada Buddhist technique of vipassana... essentially an exhaustive cataloguing of every aspect of experience, up to and including the cessation of everything. The vipassana yogi, like the Victorian collector, is engaged in taxonomy – a taxonomy of things which are disappearing. Someone practicing vipassana trains his or her awareness on every minute detail of experience, and observes it while it burns away. At the completion of this enlightenment nothing is left. The literal meaning of the Sanskrit word nirvana is ‘extinguishing’, referring to the going out of a light. This idea of extinction will be the main organizing principle for me. By my action I hope to sensitize us to the sorrow of loss. My aim is to engage emotionally with the fact of the massive loss of memes, genes and habitats which we ourselves are precipitating on a planetary scale ..."
Oh, and if you suspect he's sneakily using his retreat from human society to play Grand Theft Auto San Andreas, you can keep tabs on him via webcam. "The museum itself is a library of Babel, a seed bank and an ark. It is Gaia’s memory. At the apex of this body of knowledge, perched in a tower as a brain is perched on a spine, the hermit might symbolise conscious agency. The hermit dramatises the dialectic between deliberate, mindful knowledge and the hidden, or forgotten unconscious. I will use his presence to focus questions of stewardship, storage, and conservation, of profligacy, amnesia, and extinction." 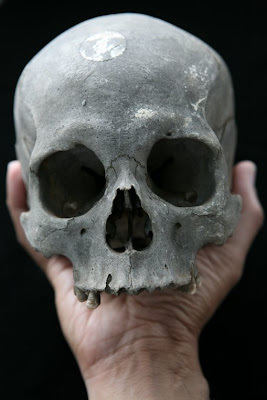 The first item is the skull pictured above and has attracted 11 comments so far. If you're interested, join the conversation. Kudos to Manchester Museum for having the chutzpah to mount such a visionary project. Thanks anonymous, I'll add that in my next new blog roundup.